All system components include portable bases. Designed to accept and discharge one or two containers at a time. Dumper discharges at 76”, with a 45° discharge angle. Unit has inflatable seals and UHMW debris guards to prevent contaminants from entering product flow. 304-2b stainless steel skip is 96” wide by 52” deep. Custom hoppers are constructed using 304-2b stainless steel with continuous, polished/passivated welds and are easily cleaned. Hoppers include a manually adjustable slide gate to control material flow into the feeder. 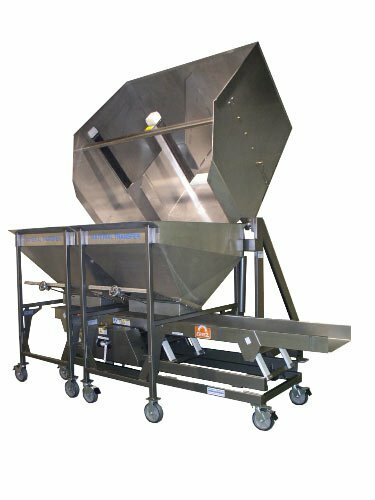 Vibratory feeder system features a 24” wide x 150” long stainless steel tray. 3 GPM hydraulic system housed in an enclosure for easy cleaning. Feeder controls mounted in a Hoffman NEMA 4X stainless steel control panel with variable speed control to adjust feed rates.